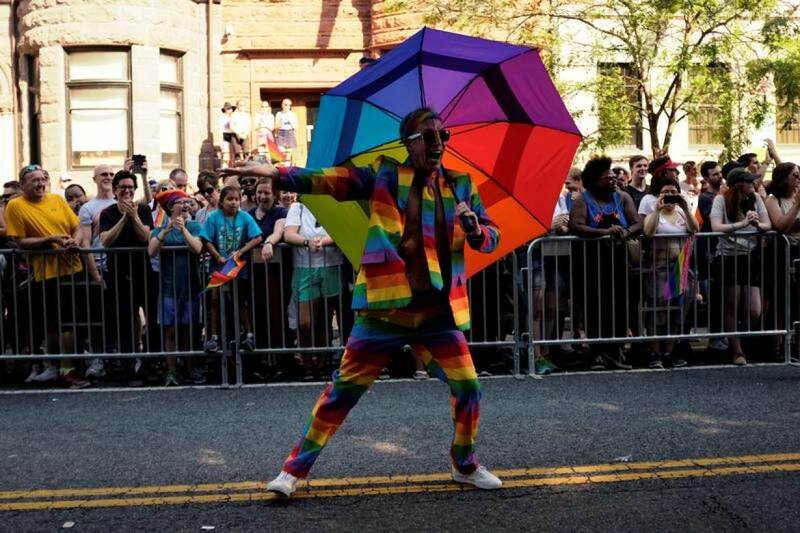 Thousands of revellers, some waving rainbow flags, crowded Washington streets on Saturday for the city’s gay pride parade, in an annual party that saw anti-corporate protesters briefly block its route. Cheering spectators packed sidewalks as floats with rainbow balloons and papier maché rainbows snaked 1.5 miles (2.4 km) through residential neighbourhoods several blocks north of the White House. In almost 90 Fahrenheit (32 Celsius) heat, some men went shirtless or donned feather boas. Protesters who oppose the Capital Pride parade’s corporate backing, which includes bank, Wells Fargo & Co, and weapons maker, Northrop Grumman Corp, briefly blocked the parade route and forced it to be rerouted. The protest group, No Justice No Pride, said in a statement that Capital Pride also needed to add a transgender minority woman to its board, and bar police from marching in the parade. The Capital Pride parade was among a bevy of gay pride events this weekend scheduled for cities across the United States, including Boston, Detroit, Milwaukee, and Kalamazoo, Michigan. “We need to be out here to tell people that God loves them for who they are and who they love,” said the Rev Alex Dyer, 38, an Episcopal priest from Washington, who marched in the parade with his husband and 2-year-old daughter. The parade in the heavily Democratic U.S. capital featured T-shirts that said “Love Trumps Hate,” an apparent reference to President Donald Trump. The Republican has voiced support for gay rights, but his administration has revoked federal guidelines that let transgender students use bathrooms of their choice. Damian Jessup, 30, who traveled from Norfolk, Virginia, to march with gay Republicans, defended Trump and his support for gays. The Washington parade came a day ahead of a so-called Resist March in Los Angeles against Trump, which is taking the place of the annual pride parade. In San Francisco, the SF Weekly newspaper reported the parade in that city would include a “resistance contingent”, and an immigrant rights speaker. Early on Monday, the owner of the shuttered Pulse gay nightclub in Orlando, Florida, is set to open its doors in remembrance of victims of [the] mass shooting there on June 12, 2016, that killed 49 people. ← Australia: Time to make them vote!